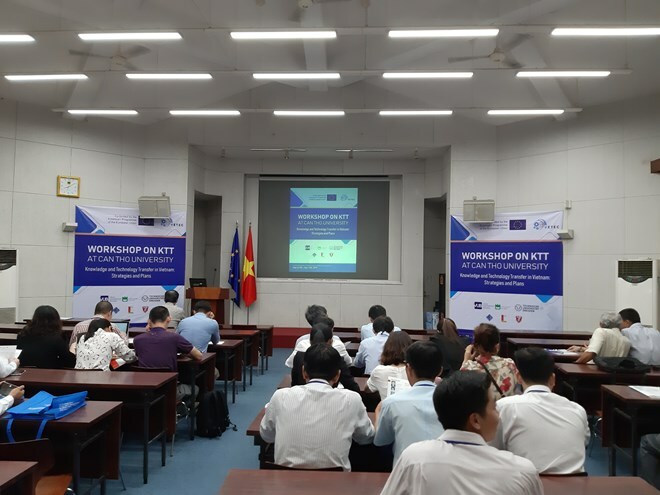 Can Tho (VNA) – A workshop was held at Can Tho University on March 25 to discuss the transfer of knowledge and technologies from Europe to Vietnam. The event was part of the Vietnamese-European Knowledge and Technology Transfer Education Consortium (VETEC), a project funded by the European Union’s Erasmus programme. Project coordinator Assoc. Prof. Nguyen Vo Chau Ngan said experts from different fields in Vietnamese and European universities discussed how to successfully transfer knowledge and technologies amid Vietnam’s specific conditions. They also looked into the building of strategies and implementation plans to boost future knowledge development and technology transfers in the country, towards helping to promote local and national economic development, he added. Prof. Nguyen Thanh Phuong, Vice Rector of Can Tho University, noted some of the difficulties in technology transfers in Vietnam, acknowledging that universities, academies and provincial departments of science and technology have been striving to step up the transfer and application of knowledge and technology to create products that better serve society. However, outcomes have been varied and overall remain unsatisfactory. The VETEC project – coordinated by Belgium’s Vrije Universiteit Brussel – has been carried out since 2017 under the partnership between the University of Aveiro of Portugal; the Dresden University of Technology of Germany; and the Hanoi University of Science and Technology, Hue University, and Can Tho University of Vietnam. It is worth over 770,000 EUR (nearly 871,400 USD), including over 700,000 EUR funded by the EU.